During the public consultation period, concerns were raised with respect to the proposed changes on Routes 9 and 31 through the Whitehills area. The main concerns were related to Route 9 operating along Limberlost and Route 31 operating along Aldersbrook. From the feedback received the majority of residents living along Limberlost indicated they are destined to Western University and conversely the majority of residents living along Aldersbrook indicated they are destined to downtown. In response to the feedback, two alternative routing options through Whitehills were proposed. Option 1 would serve the intersection of Wonderland and Fanshawe Park Roads and provide two-way service along Limberlost. Option 2 would provide two-way service along Sarnia Road and Aldersbrook Road and terminate at Hyde Park Power Centre; frequency would decrease slightly on Route 9 and increase on Route 31 in option 2. Support for both options was evenly split with a small preference for option 1. As a result, option 1 was approved. The routing changes in Whitehills will have some impacts on passengers who currently have a one-bus ride to their destination. Passengers on Aldersbrook that currently have Route 9 service, may lose direct downtown transit service while gaining direct University service. Passengers on Limberlost will lose direct service to the Hyde Park Power Centre and either Western University or Downtown. The overall impact is not expected to be significant as there are many transfer opportunities along Sarnia and Western Roads. Service through the Orchard Park neighbourhood will be removed, leaving a small section of the area more than 400m to transit stop. With approved changes, there is a loss of transit service on Aldersbrook Road east of Aldersbrook Gate; however, there are only 30 daily riders who currently board or alight in this area and the majority will be within 400 metres of the proposed Route 9 stops. 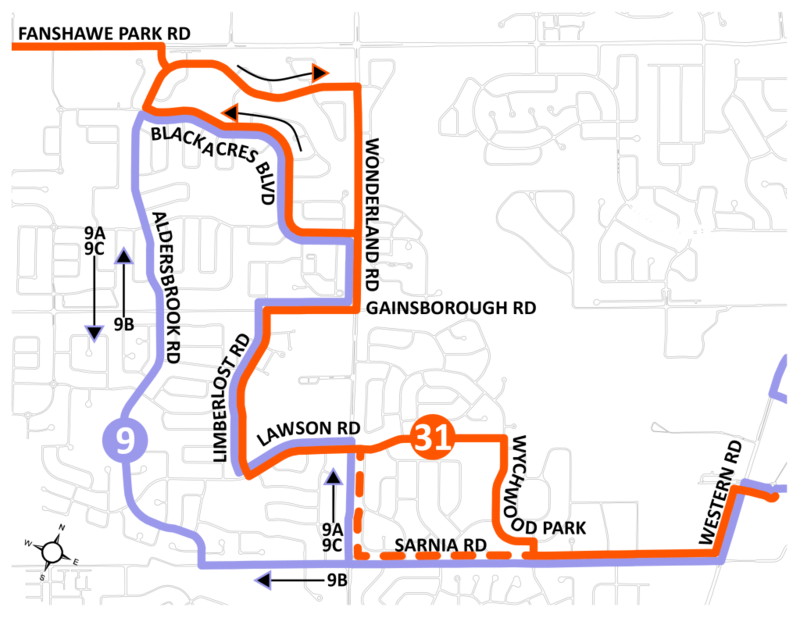 The elimination of the Route 31/32 interline would remove a direct connection between the Hyde Park Centre/Aldersbrook Road and Kipps Ln/Huron & Highbury. 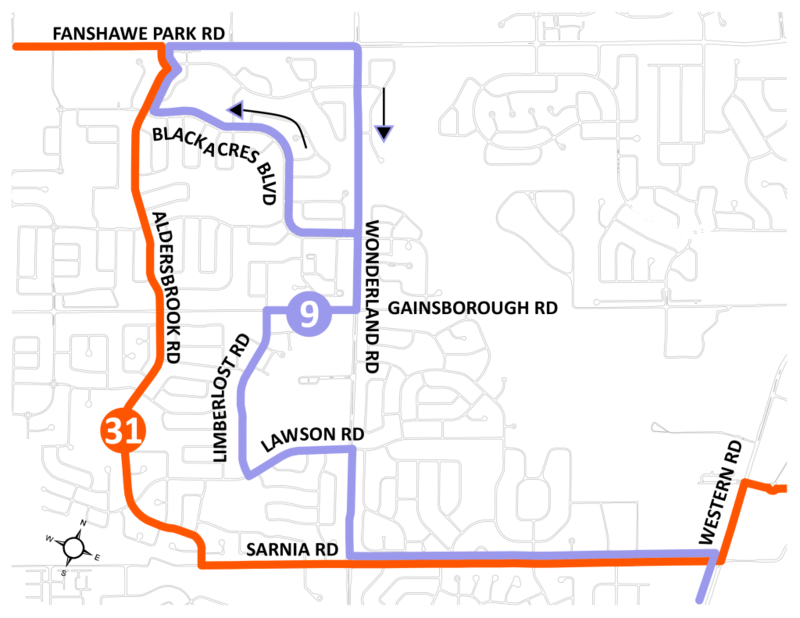 While the current 31/32 routing provides a direct connection between the Power Centre and East London on average it is faster to connect with Route 38/39 along Fanshawe Park Road between the two areas. Ridership productivity and growth as a whole is projected to increase with the changes. Finally, Route 9 will no longer be interlined with Route 6 in the evenings and will operate to downtown during all time periods.